This yogurt-based dip sparkles with flowers and herbs. To strain yogurt Line a strainer or colander with coffee filters, paper towels, or cheese cloth. Spoon yogurt into strainer. Set the strainer over a bowl. Nest the strainer in the bowl but you want the strainer raised from the bottom of the bowl to it’s not sitting in the drained liquid. Cover with plastic wrap and refrigerate 12-24 hours. The goal is to remove as much of the liquid whey as possible so the spread is firm, not runny. Two cups yogurt will result in about a cup of strained yogurt. Herb Spread: Spread yogurt on a food-safe plate. Sprinkle herbs, flower petals, salt and pepper over. Dip may be chilled 3-4 hours before serving which also helps flavors develop. One of the prettiest dishes. Ever! 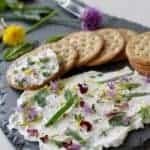 Herb and Flower Yogurt Spread is quick, easy and healthier appetizer than most dips and spreads. Plus it sparkles!